Sessions Revelations Put 'Quiet, Behind-The-Scenes' Russian Envoy In Spotlight : Parallels Jeff Sessions, now attorney general, met twice last year with Sergey Kislyak, Russia's U.S. ambassador. This has raised more questions about contacts between the Trump campaign and Russian officials. Russian Ambassador Sergey Kislyak arrives before President Trump's address to a joint session of Congress on Tuesday. 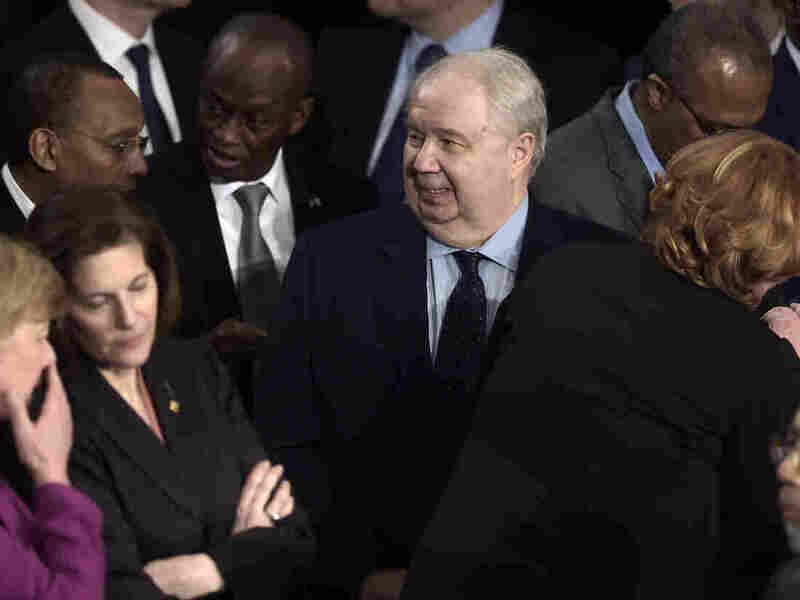 Russia's ambassador to the United States, Sergey Kislyak, is not known to seek the limelight. He's a mild-mannered diplomat and an arms control expert who came to Washington as ambassador in 2008. But he has been in the news a lot of late, as Trump administration contacts with him come under scrutiny. Michael Flynn, President Trump's original national security adviser, had to resign after misleading the administration about his phone calls with Kislyak. And now, Trump's attorney general, Jeff Sessions, has come under fire for meeting twice with the ambassador last year. "I never had meetings with Russian operatives or Russian intermediaries about the Trump campaign," Sessions said Thursday. But he announced he would recuse himself "from any existing or future investigations of any matters related in any way to the campaigns for president of the United States." Speaking at Stanford University last November, Kislyak defended his contacts with Trump surrogates. "Our job is to talk to all the people, be it Republicans, be it Democrats, whether they work for a campaign, whether they don't work for a campaign," he said. "Our job is to understand." He also lamented the souring of U.S.-Russia relations. "We are living in the worst point in our relations after the end of the Cold War," he said. But the ambassador complained that the U.S. is trying to contain Russia, through sanctions and political pressure. Kislyak has built a reputation in Washington as a pragmatist. Alexander Vershbow, a former U.S. ambassador and NATO official, has known him since the 1990s and negotiated directly with him when both served as ambassadors to NATO. Vershbow says when he left that job to become U.S. ambassador to Russia, Kislyak gave him a gift — an album by the Red Army Chorus called Our Answer to NATO. It was all in good humor, Vershbow says, and that's the kind of ambassador Kislyak is — patriotic but personable. "He's much more of a quiet, behind-the-scenes type," Vershbow says, "a real experts' expert on arms control and security issues ... but also has a good reputation as a problem-solver, one of the relatively pragmatic and nonpolemical diplomats I've dealt with." A former Obama administration official, Philip Gordon, found the same in his dealings with Kislyak. In the early days of the Obama administration's "reset" of relations with Russia, Kislyak played a key role. "There was a real agenda," Gordon says, "and Kislyak was a part of that positive development in relations between the two countries." Dmitry Medvedev was Russia's president at the time. But when Vladimir Putin returned to the job, the Kremlin set a different tone, says Gordon, now at the Council on Foreign Relations. "We started to hear the differences," Gordon recalls, "and the Russian ambassador reflected those, just as he reflected his government's policies when we were in a more positive phase." Gordon says it was not surprising to see Kislyak make contact with Trump surrogates during the campaign. But he says it is alarming that those advisers weren't upfront with Americans about those contacts. Those who support more pragmatic dealings with Russia say that just got more difficult. "Very few people probably would want to meet with Russia's ambassador," says Paul Saunders of the Center for the National Interest, a conservative think tank that has frequently hosted Kislyak. "That really doesn't really have anything to do with him personally. But I think it has become, in our political climate, increasingly damaging to admit to contacts like that." The same is likely to be the case for the next ambassador. Russian news reports have said Kislyak will be replaced by Anatoly Antonov, who has a reputation as a hard-liner.